Featuring free Wi-Fi free breakfast and a pool the budget-friendly Days Inn Seneca offers simple affordable accommodations near fishing boating and Clemson University. Each one of the 63 exterior-access rooms at the two-story Days Inn features free Wi-Fi a desk a coffeemaker a mini-fridge a microwave a hairdryer and cable TV; some rooms also have a kitchenette. For breakfast the hotel offers a free continental menu of cereal bagels muffins pastries coffee and juice. In addition to a seasonal outdoor pool the hotel offers meeting rooms and fax and copy services. 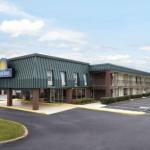 The Days Inn is off Highway 123 in Seneca within a mile of restaurants a cinema two shopping areas and Oconee Medical Center. Clemson University is 15 minutes away as is World of Energy the educational museum at Oconee Nuclear Station. There are dozens of excellent lakes within an hour's drive including Lake Jocassee Lake Hartwell and Lake Keowee. Greenville-Spartanburg International Airport is 53 miles away.